First Time Mama - First Time Blogger: Watermark your photos and 'Eyes' challenge! If you visit blogs regularly, then you'll notice some bloggers tend to watermark their photos. I was doing this at one time, but then I stopped for no better reason than I got lazy. Well. I have started watermarking photos again for this reason. Please (I beg you) read this blog post over at "A Sorta Fairytale" about watermarking and WHY (& how) you need to do it. This Mama has 2 young adorable sons and posts many pictures of her boys (like we all do!!). Someone actually stole her pictures from her blog of her older boy, and created a facebook page about him saying it was HER own son!! How super freakin creepy is that? That freaked me out enough to immediately start watermarking again. Right away. It takes more time but it's worth it. I love sharing my photos of Julianna too much to sht down all together, so for me, I will watermark from now on no matter what. 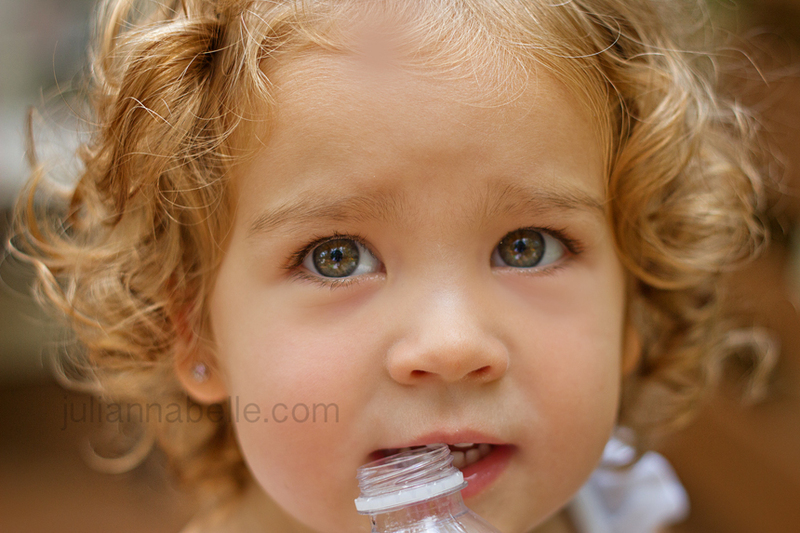 One key point about watermarking, which Mandy at "A sorta fairytale' points out in her post: When you put the watermark on the photo, make sure to put it close to your child's face or body, so it cannot be cropped out easily. I used to hide the watermarks in the corner or bottom of the photo, and looking back, I realize those are way too easy to crop out by someone that wants to use the pictures of your babies for no good. Can you imagine someone stealing your child's photos and saying it's their child? And then posting photos over & over of your child??? That would drive me off the deep end. Protect your little ones and any family members (or pets!) you care about. Watermark. Here is the link to Mandy's blog again for you to read what happened to her and how to watermark. The way I used to watermark last year - If you notice, the watermark is at the bottom and can easily be cropped out by a bad-doer. Now... 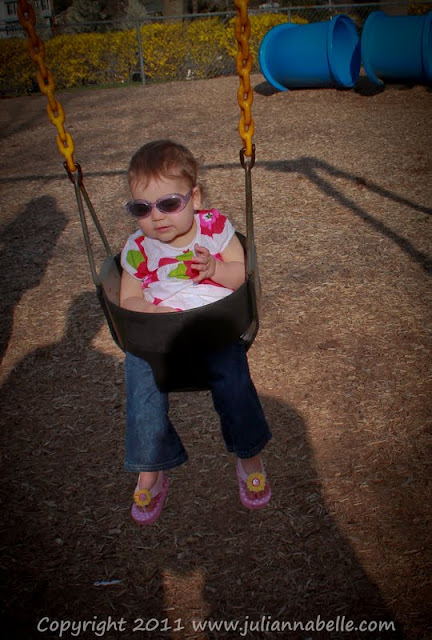 I try to get the watermark near my daughter's face or body to make it much harder to crop out. I don't worry so much about landscape or nature shots since I could care less if someone takes one of those. It's not the same as my child. 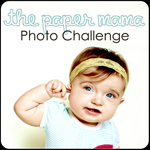 I am linking up to the PAPER MAMA for her challenge called "EYES" with my above photo. 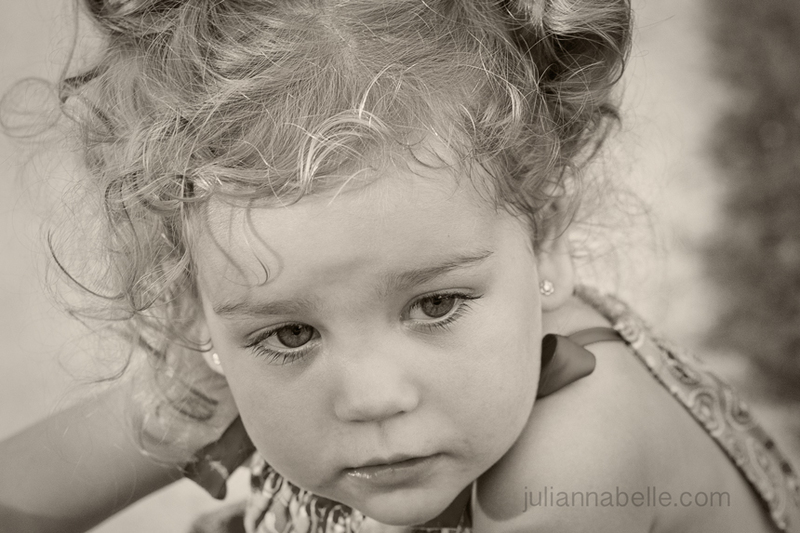 I just love Julianna's eyes in this shot. So expressive and deep! Another example of watermarking near the face. I would like to hope this protects her from most evil people. I have a disabled function on my blog that you can't take my pictures. I should watermark them too. This is a great subject to blog about! I'm guilty of water marking in the way corner of my pictures so that they could easily be cropped out which isn't good I know! I have to start water marking differently! I just seriously hate to ruin a great picture with text or logos across the subject but the safety of my child is way more important. I need to look into right click disabling. This way you can't copy or save the picture at all; this would be ideal! I wish blogger would let you watermark as you upload to your blog, I always do it straight from my computer, now if I have to upload to another program first, I'll never find the time to put my pics on. I did used to have it where you couldn't right click, I need to see if I undid that or not and if I did then I'm going to make it back like that...at least that will keep them from being able to easily save the pics. So frustrating, but thanks for bringing it to everyone's attention! Yeah funny you say that Alicia - I am hoping Blogger comes up with some option to put a blanket watermark on your own photos but I guess that is asking for a lot... there are so many ways to do it but it does take time and if your time is limited, then it's hard to do! THe right click protection is good, it will protect your shots but not from everyone. It is frustrating - you are right! I actually put the right click protect on my pics then removed it b/c I was annoyed i couldn't right click to open some of my links so I removed it due to my own annoyance LOL . WOah I have no idea how all those spaces got in there LOL! Ha!! Thanks for the link, that's what I'm going to do for now. I'll keep my fingers crossed that blogger does something...you would think they would since it's a security issue. I think the right click protect is going to annoy me also, but it's better than having to worry about all those pics that are already on my blog and not watermarked! Thanks for stopping by today :) I came over to check out your photo, and am so glad I did! I used to watermark at the bottom too, but have been doing a better job of it the past month or so. Another reminder to keep it up. Anyway, that is a wonderful photo of your daughter. It looks like her eyes are still changing color? They are surely beautiful. Thank you Jen! And it's funny b/c Julianna's eyes were crystal greyish blue for the first year ... and then they slowly turned to this light hazel and it looks like they are sticking there. THey are greenish brown now - depending on the light they look blue sometimes too - so strange but my dad had the same thing with his eyes and so does my husband, so it looks like they are staying there for now anyway :) Have a nice day! So happy for this info! Your whole blog is full of such amazing photography. I loved looking around! I saw your pictures on Paper Mama, and I wanted to invite you to my photo link party. The theme this week is "summer", and I'd love for you to share your photography with us there each Friday!